﻿ BlueSun Hotel, Da Nang | FROM $39 - SAVE ON AGODA! 3 travelers have booked today. Have a question for BlueSun Hotel? "Location wise - lotsa seafood restns by the beach and the nearest minimart is justacross the road." "Overall this is a great hotel." "It was great, large clean and with a great." "The Staff is very friendly and helpful." 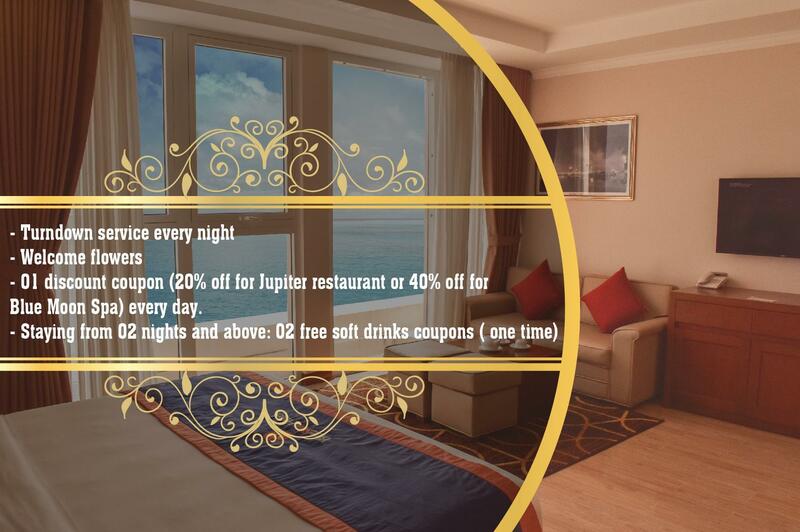 Located in the lovely area of Phuoc My, BlueSun Hotel enjoys a commanding position in the family fun, beaches, sightseeing hub of Da Nang. Only 5 Km away, this 4-star hotel can be easily accessed from the airport. With its convenient location, the hotel offers easy access to the city's must-see destinations. 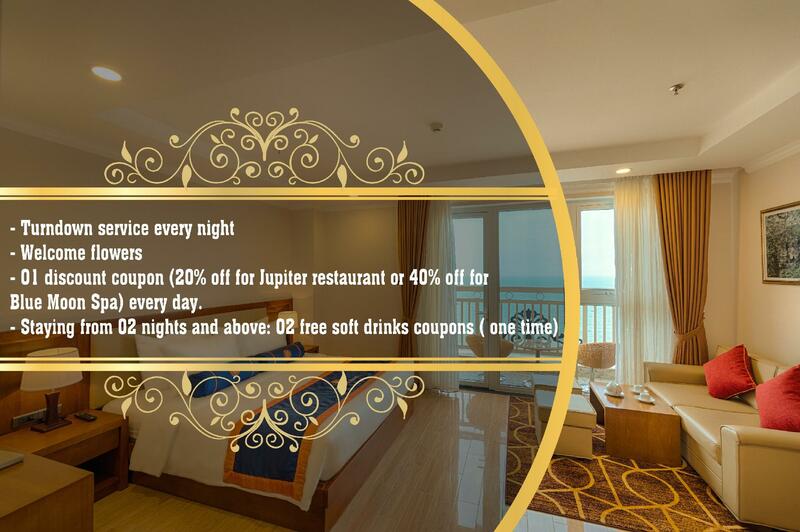 BlueSun Hotel also offers many facilities to enrich your stay in Da Nang. Guests of the hotel can enjoy on-site features like 24-hour room service, free Wi-Fi in all rooms, 24-hour security, daily housekeeping, fireplace. Experience high quality room facilities during your stay here. Some rooms include television LCD/plasma screen, additional bathroom, additional toilet, complimentary instant coffee, complimentary tea, provided to help guests recharge after a long day. The hotel offers wonderful recreational facilities such as hot tub, fitness center, sauna, indoor pool, spa to make your stay truly unforgettable. 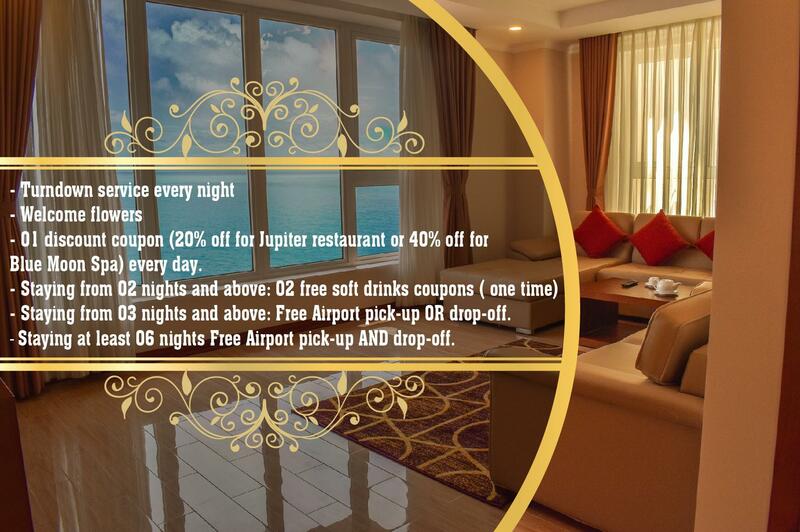 BlueSun Hotel is a smart choice for travelers to Da Nang, offering a relaxed and hassle-free stay every time. "Good hotel with great location, walking distance to nice bea..."
We stayed here an extra 2 night, we have a suit with a great sea view which to see the sunrise at 5am was lovely, the breakfast wasnt to bad, they did have bacon and you can get fresh fried eggs, we rented a scooter around the corn for only 1,200 a day which was the best price we ound though out vietnam, worth a vist and stay. we booked the VIP double sea view room, however its not double just a single view which is ok. As on the website, what you see is what u get. Small selection for breakfast but the staff were very accommodating when we requested for sunny side up egg. Location wise - lotsa seafood restns by the beach and the nearest minimart is justacross the road. neverthless, service and the staff were very friendly! I stayed one night in the sea view room, which I highly recommend, as the view is amazing. Right opposite the beach. Great sized room with a big bathroom. Breakfast buffet was delicious, plenty of choice. I also had lunch at the hotel. Quick taxi ride into the main Danang area. The staff were really helpful and friendly. I would stay here again. The Staff is very friendly and helpful. The location is close to beach, but not directly access to the beach. You need to cross a very busy main road to get to the beach. The buffet is not up to expectation, but still okie overall. Dear Valued Guest, We are very grateful that we have a chance to serve you in your Danang trip. Our staffs at BlueSun Hotel are always looking for customers’ feedbacks in order to improve our service. The busy main road has always been one of our main concerns. So, our security guards are always ready to help our guests cross the road. Our breakfast menu covers a wide range of food. In addition, you can also ask the chef to serve you any special order you may have. We are sorry about any inconveniences that you have experienced. BlueSun Hotel hopes to welcome you again in your next trip. Bluesun Hotel. Overall this is a great hotel. We had the family apartment. It was great, large clean and with a great. View. However there are a couple of negatives. Firstly...there is music pumping through the walls every night until about 10:30 or 11. Not the hotels fault, but still a little annoying. It's not loud, bit you'll notice it. Secondly..we and airport transfers included, but when we got to the airport the driver turned around and requested 15000 d from us for the parking ticket. This doesn't feel right....and I would recommend clarifying this with the hotel if you have transfers included. Fabulous location right across from the beach, awesome room - always neat and tidy, staff were amazing. Our 2nd stay there and we'd go back again! Arrived at the hotel gate. No one there to greet & collect my bags from the taxi. Called a staff member who looked like a bell boy did not do anything other than ask another neighbouring hotel staff to do the work. Once inside nothing special. Going up to the room the bell boy behaved very in appropriately. Looking at the luggage & giggling like a moron. Breakfast was disappointing. 10/20 item menu. None of the food tastes good. There is no convenient store around the hotel. No good restaurants. Hotels has regular facilities like fitness center swimming pool, Spa ,restaurant etc. Dear Mr MOSADDEQUE, We apologize for making you unhappy during your staying with our hotel. We double checked your case, the taxi picked up you on that day, parked in front of beside hotel ( Diamond Sea hotel), and the staff you met is a commis, so he didn’t understand and thought that you booked at Diamond Sea hotel. Our breakfast menu also alacarte menu is plentiful and qualitative ( most of guest evaluated that), we’re so regretted that our menu was not suitable with your taste ( in this case, customer can ask our hotel have special foods as taste). Once again, we are sorry for this! Wishing health and success to you! Yours sincerely, BlueSun Hotel. Dear Valued Guest, First of all, We would like to express our gratefulness for choosing our hotel and your feedback. We are so happy to know how much you enjoyed your stay with our hotel. We have been making ceaseless efforts every day to provide the best customer services. We do hope to welcome you back in nearest day. Wishing health and success to you! Yours sincerely, BlueSun Hotel. Quiet enough. Clean. Staff was nice. Breakfast buffet was included and was well done. Only shortcoming is that whenever you ask for more soap, more shampoo, more towels, etc they always forget something. We arrived hotel early and they allowed us to check in earlier. Besides, we have no time to enjoy the breakfast buffet due to need to take early morning flight on our check out day, but hotel staff packed us breakfast when the time we check out! This is really appreciated! Hotel room and bedding is ok for accommodate 3 people! Location is good too, near the beach! good location with mini mart and food places walking distance. Da nang beach just across the road in front. get the sea view if possible. however room make up service is late and we have to remind them. breakfast was okay, nothing spectacular. My trip at Da Nang was excellent. BlueSun was very good. However the Mai Linh taxi driver that staff called for me made me upset. Instead of take me to survernir shop 800m near by, he brought me to another shop, "bigger" as he said but actually one third size and 10 kms away from hotel. So I has to set 3 stars only to hotel. Good location for Da Nang beach, Room clean and with the usual facilities, Breakfast was not great with only one Western option (how you wanted your eggs). Pool small and inside, no where to lounge. Just some tables and chairs outside. Staff were very good and helpful. There are so many places to pick, but we picked this place due to the proximity to the beach. This is as close to the beaches you can get while still being closer to the city center. The rooms look like the pictures in the website., so don't worry book with confidence. The room that we had was very clean. The partial view of the beach was very nice from the 9th floor. Eat the breakfast there, very good food service. A couple of small cons I did notice, but these are not deal breakers for me. The hallways smelled like the beach or some kind of odor. I presume that some of the other tourists might be smoking in the hallways, but I didn't see it for myself. The people that worked there are extremely helpful. If you need anything these people will help you. I needed recommendations on where to eat and they were happy to provide some. The spa here was fantastic and decently priced. Remember to tip the masseuses. Overall, I would love to book this place again. Room condition and staffs are really good. Has a nice balcony overlooking the ocean. They offered us 30% discount to use on their spa and as well as 30min complimentary massage whice we really enjoyed a lot. Overall, bluesun hotel is nice choice for the money. We've booked the VIP rooms but the room is different with the photo shows on the web site as it looks much older than the photo, there is a strange smell in the room and I've found a little cockroach at the sofa, the terrace door is difficult to lock too. We've found the car booking service at the hotel is much higher than the green taxi outside, we originally would like to book the hotel car to the sightseeing point/airport but found it quite expensive, thus I ask the staff at counter whether they can help us to book the taxi and ask about the price, but the staff said that their price is the cheapest and reject to help us to call the taxi. Finally we call the taxi by ourself and the price is much cheaper then hotel!! (45000VND to airport for hotel car but only 10000 VND for green taxi), the staff is telling lie obviously. The swimming pool in the hotel is quite small too. The only good point of the hotel is that the room is facing the sea thus I can see the sunset conveniently, but many hotel facing the sea can do this. 2 travelers found this review helpful. Did you?